IN A GLANCE: Agents of the Reaper is even better than the first book in this great series. This book is filled with great characters and a fantastic plot! A great middle grade read! I absolutely love it when we as readers get to see an author grow in his craft, that's exactly what I saw in Agents of the Reaper, the second book in the Sebastian and the Afterlife series. William J. Barry takes his Sebastian and the Afterlife characters to new heights in the second book of this series. 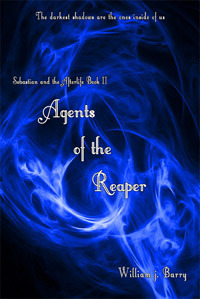 In Agents of the Reaper, our main character Sebastian is kidnapped by the Soul pirates, but he's not alone. Sid, one of the professors at the school, is with him. Will they be saved? Or will all be lost? I really enjoyed reading these great characters stories and just like the author grew so did his great characters. I love how Sebastian is very protective of the ones he loves and has left behind. I also really liked how he knew he must let Sarah go and move on with her life, even when its really hard for him to do! In this aspect the book seems so real, when someone dies that we love and care for deeply, we dont want to move on. We want to hold tight to that love. I love how these books depict that emotion, but at the same time shows how we need to move on as well! I can't wait to see what comes next in this series and from this wonderful author. I will stick with my recommendation from the first book in this series for this one as well. This is a great read for a middle grader/teen!